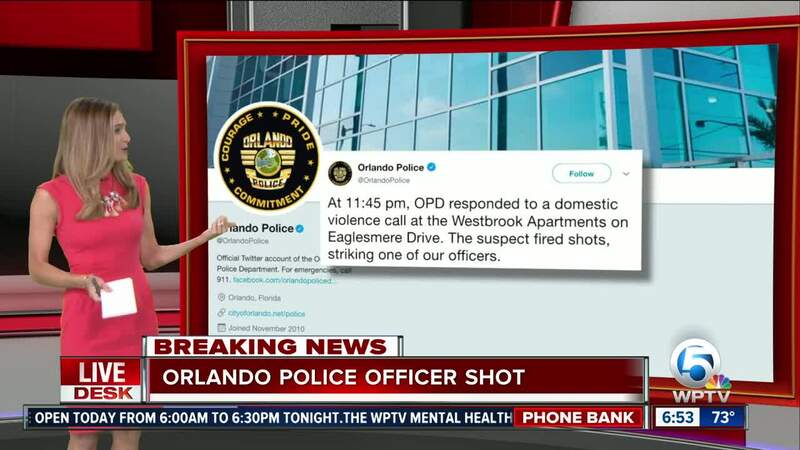 ORLANDO, Fla. (AP) — Police officers in Florida responding to an overnight domestic dispute were met with gunfire that seriously wounded an officer before the gunman barricaded himself in an apartment with four young children. Orlando Police Chief John Mina said Monday that the officer is expected to live despite "very significant injuries." Officers were called to the Westbrook Apartments near the Universal Orlando Resort theme park resort late Sunday by a woman who said her boyfriend had beaten her. When officers arrived at the apartment, gunfire was exchanged, hitting the officer, Mina said. The police chief said he doesn't know if the man was shot. The officer was taken to Orlando Regional Medical Center, where he underwent surgery and was expected to survive. The police chief asked the community for prayers for the officer and his family. Mina said the gunman was holed up with four children, ages 1, 6, 10 and 11. The children were believed to belong to both the suspect and his girlfriend. "Our main concern is the safety of the children in that apartment," Mina said. Police have not released the name of the suspect or the officer. Judy Pepper, who lives in the apartment complex, told the Orlando Sentinel that she had fallen asleep on the couch after watching a Sunday night baseball game on television when she heard four loud gunshots. Officers evacuated other residents of the complex in the middle of the night. Some were milling around nearby restaurant parking lots Monday morning, still wearing pajamas. They were later taken to a nearby hotel.